As former slaves entered American culture and society as citizens with slightly more rights after the Civil War and Reconstruction they created bands and groups for themselves to play in. 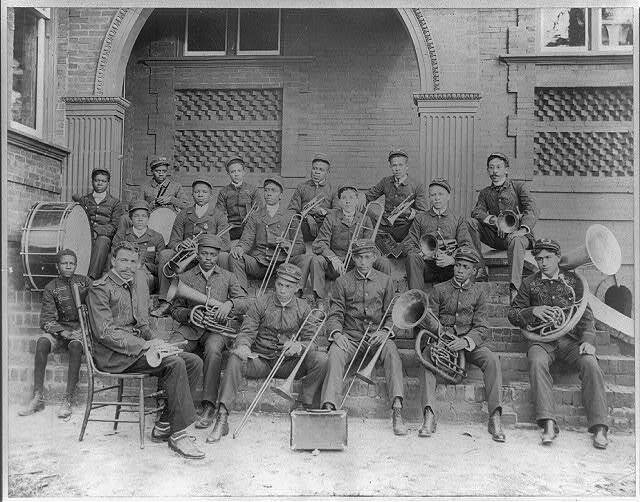 In the late 19th and early 20th century military bands, small orchestras, and “stock bands” were formed mostly performing popular music of the day as well as notable Classical music such as Mozart Operas. At this time spiritual music had long been co-opted by white culture with many former slave songs being compiled in “American” songbooks. 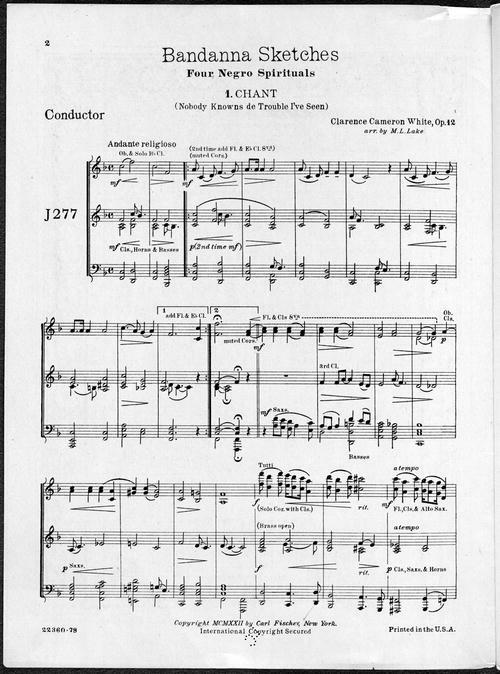 In the 1920s black composers and arrangers were able to publish their settings for these groups. Composers Gussie Davis, M.L. Lake, Robert Cole, and others were very popular stock band composers and arrangers during the ’20s. 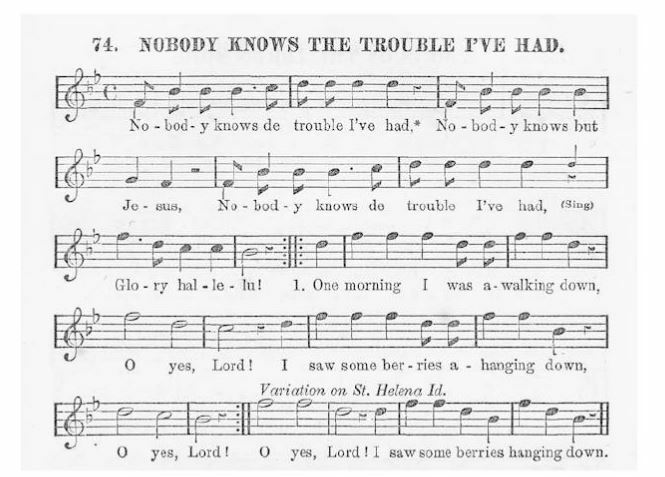 Here is a setting of the familiar tune “Nobody knows de trouble I seen” from M.L. Lake. We can find the melody in the treble voice and this is a form of the melody that modern listeners would most likely be familiar with. However because of its setting it and acculturation it is rife with western harmonization and figuration. This adaptation of black folk songs is something that we are very comfortable with and reminds me of William Grant-Still’s Afro-American Symphony. H.T. Burleigh (1866-1949) was an essential figure in bringing black folk music to the classical music scene in post-reconstruction America. He introduced popular singers to the literature and was well connected with influential musical big-wigs, including Antonin Dvorak. H.T. 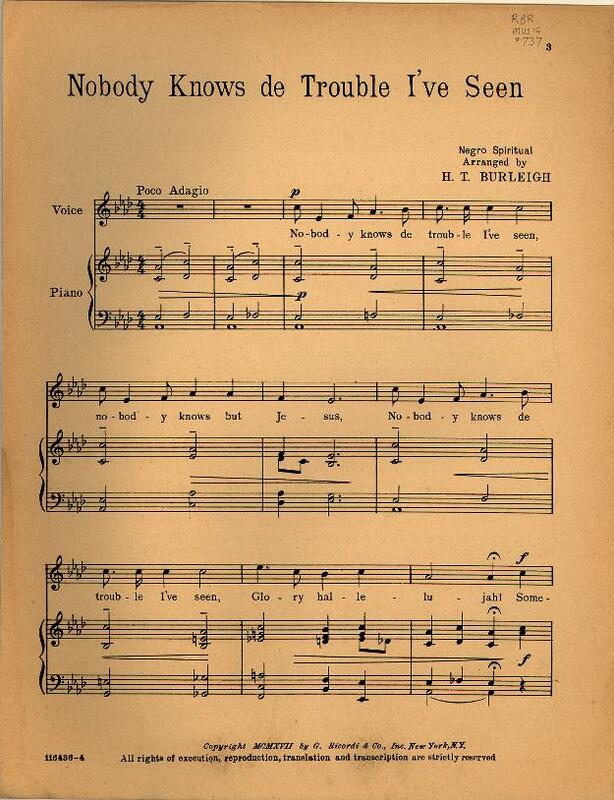 Burleigh’s setting of “Nobody knows” for voice and piano. The earliest notated record of this particular tune we have is from Slave Songs of the United States, published in 1867, the seminal work of collecting slave songs in the Antebellum South. This representation from the collection is not definite however, it is still subject to editing and doesn’t account for massive variation across the southern states. This post outlines how different settings of the same tune have been treated when brought into a western context and setting. First the tune is in its most original form (that we have available), then adapted to solo voice and piano for mass consumption and use in the home and then finally used as popular music that can be recognized by the populous who attend concerts.